The annual Palisade Bluegrass & Roots Festival is gearing up for an exciting 2017 event. This Colorado music festival is celebrating its ninth year as one of the most original and authentic bluegrass & roots festivals in the west. The annual Palisade Bluegrass & Roots Festival is gearing up for an exciting 2017 event. This Colorado music festival is celebrating its ninth year as one of the most original and authentic bluegrass & roots festivals in the west. Enjoy the soul soothing vibes of some of the hottest bluegrass bands in the country while you dance the night away on the banks of the Colorado River. This year's lineup is certain to bring travelers from across the country as we assemble the most talented, sought after bands in the industry for three days of harmonious magic. 3 p.m. - Let Them Roar – Let Them Roar weaves mountain folk into a soulful tapestry of roots, rock and raw improvisations. 4 p.m. - The Sweet Lilies – This group’s high-energy, melodic tunes have quickly captured the hearts and music souls of fans in Colorado and beyond. Blending Americana and bluegrass sounds, this magnetic group creates a style all their own. 5:15 p.m. - Mayhem Gulch - In a world of mayhem, Mayhem Gulch shines like a whiskey-fueled campfire jam on a crisp summer evening in the Rocky Mountains. Mayhem Gulch brings a fresh perspective on Bluegrass and Americana music that is sure to get your foot a tapping, your hips a shaking, and your soul a soaring! 6:30 p.m. - The Lonesome Days - Winner of the 2016 UllrGrass Band Competition, this soulful bluegrass band from Denver, CO has been delivering timeless classics for fans across the state. 1 p.m. - Dustbowl Revival – This nine-piece band includes a tuba, washboard, accordion, fiddle, mandolin, trumpet and guitar. Bringing Americana swing that keeps listeners moving on dance floors across the country. 3 p.m. - The Travelin’ McCourys - No other band today has the same credentials for playing traditional and progressive music. As the sons of bluegrass legend Del McCoury, Ronnie McCoury on mandolin and Rob McCoury on banjo continue their father’s work—a lifelong dedication to the power of bluegrass music to bring joy into people’s lives. 5”30 p.m. - Jeff Austin Band - After almost twenty years of live creation and endless joy seeking, Jeff has returned to the scene with a newfound sense of passion. Sharing the stage each night with a band of like-minded adventurers he attacks each performance with a fire and desire to move and shake everyone in sight. 7:30 p.m. - The Grateful Ball feat. Jeff Austin Band and The Travelin’ McCourys– This one-of-a-kind collaborative set features a boundless musical adventure through the timeless music of the Grateful Dead. 11 a.m. - Harpeth Rising – Building from the tonal depth of the cello layer in the shimmering sounds of a violin and the strikingly natural addition of banjo to create a sound at once familiar and impossible to categorize. Unapologetic genre-benders, Harpeth Rising fuses Folk, Newgrass, Rock and Classical into something organically unique. 1 p.m. - Front Country – San Francisco’s powerhouse of song and sound transcends their humble string band roots to develop a dynamic combination of soulful vocals and instrumental bliss. 3 p.m. - The Lil’ Smokies – With roots submerged in traditional bluegrass, The Lil’ Smokies have blossomed into a leading player in the progressive acoustic sphere, creating a new and wholly unique melody driven sound of their own. Captivating audiences with their unique blend of bluegrass, newgrass, exquisite musicianship and unique originals, they took home awards at the 2016 International Bluegrass Music Association as well as the 2015 Telluride Bluegrass Festival band competition. 5:30 p.m. - Keller & the Keels – Award winning flat picker Larry Keel and his rock solid, in the pocket bass playing wife, Jenny Keel make up two thirds of this fun bluegrass trio. The phenomenal instrumental technique of this group is complimented by the amazing range of vocal styles captivating and inspiring audiences of all ages. 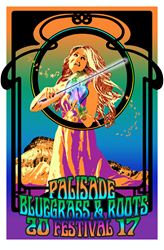 To learn more about the Palisade Bluegrass & Roots Festival, visit http://www.palisademusic.com. Early bird tickets are now available at discounted prices for a limited time only. Camping available with reservation while spaces are available.If you are interested in becoming a vendor at this year's festival, please visit our website and click "FAQ" to locate vendor application downloads.